An egg cracks--"crickety crack"--and out comes a little yellow chick! He peeps, he cheeps, he eats, and at the very end, he sleeps under Mommy's wing--"zzzzzz." 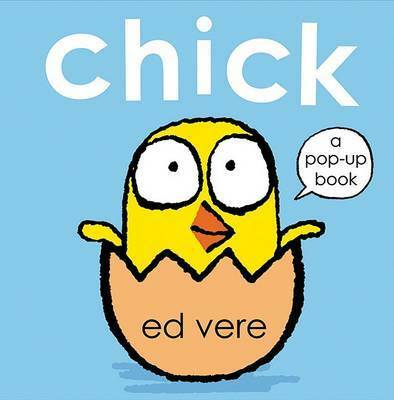 Each eye-popping page in this interactive novelty book invites the reader to jump in and play with the chick, and Ed Vere's art is appealing and brightly colored . 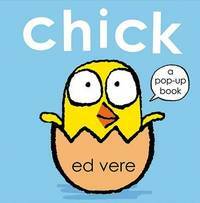 Ed Vere's new pop-up book is the perfect Easter gift for all your little chicks! Ed Vere studied fine art at the Camberwell College of Arts, and his children's books have been published in both England and the United States. Ed now lives in London, where he works from his studio, and is represented by galleries in London and Los Angeles.